A couple weeks ago, Facebook launched a link prediction contest on Kaggle, with the goal of recommending missing edges in a social graph. I love investigating social networks, so I dug around a little, and since I did well enough to score one of the coveted prizes, I’ll share my approach here. What does the network look like? I wanted to play around with the data a bit first just to get a rough feel, so I made an app to interact with the network around each node. 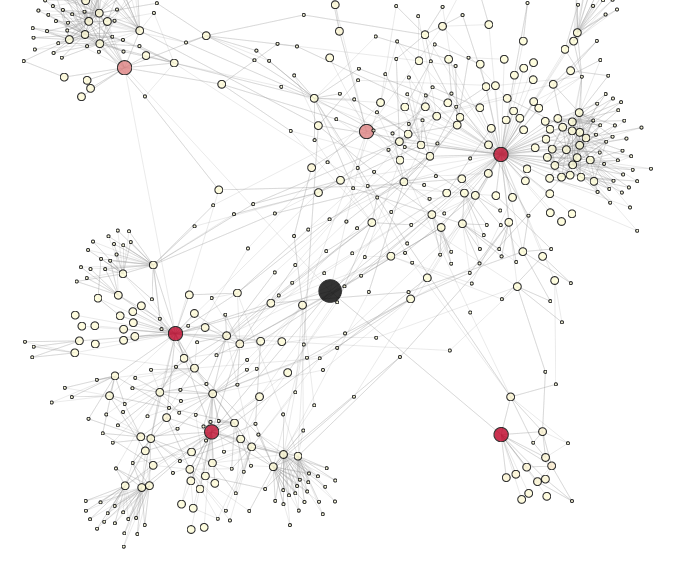 The node in black is a selected node from the training set, and we perform a breadth-first walk of the graph out to a maximum distance of 3 to uncover the local network. 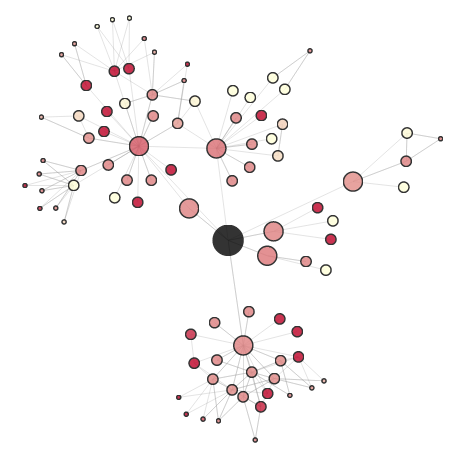 Nodes are sized according to their distance from the center, and colored according to a chosen metric (a personalized PageRank in this case; more on this later). 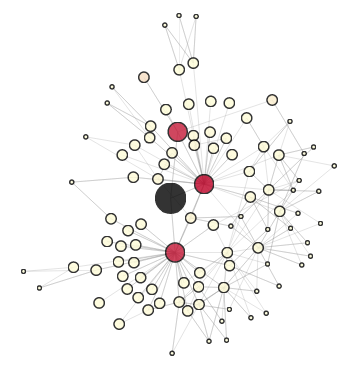 We can see that the central node is friends with three other users (in red), two of whom have fairly large, disjoint networks. 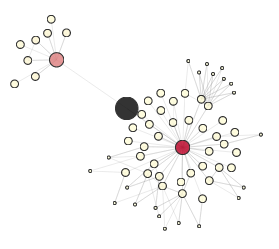 The moused over node is highlighted in black, its friends (users who both follow the node and are followed back in turn) are colored in purple, its followees are teal, and its followers in orange. 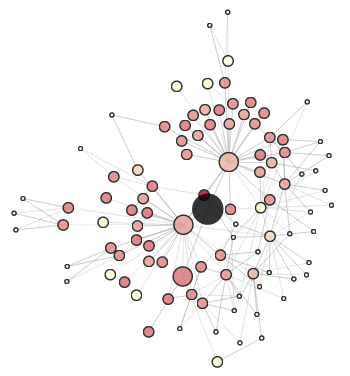 We can also see that the node shares a friend with the central user (triadic closure, holla!). Again, I encourage everyone to play around with the app here, and I’ll come back to the question of coloring each node later. Next, let’s take a more quantitative look at the graph. Notice that there are relatively more test set users with 0 followees than in the full training set, and relatively fewer test set users with 0 followers. This information could be used to better simulate a validation set for model selection, though I didn’t end up doing this myself. Finally, let’s move on to the models themselves. And so on, combining the votes of these algorithms in a fairly ad-hoc way (e.g., by taking the majority vote or by ordering by the number of followers). This worked quite well actually, but I’d been planning to move on to a more machine learned model-based approach from the beginning, so I did that next. *My validation set was formed by deleting random edges from the full training set. A slightly better approach, as mentioned above, might have been to more accurately simulate the distribution of the official test set, but I didn’t end up trying this out myself. In order to run a machine learning algorithm to recommend edges (which would take two nodes, a source and a candidate destination, and generate a score measuring the likelihood that the source would follow the destination), it’s necessary to prune the set of candidates to run the algorithm on. I used two approaches for this filtering step, both based on random walks on the graph. 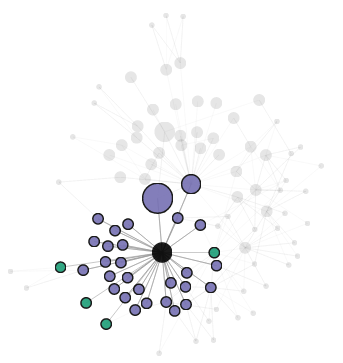 The first approach was to calculate a personalized PageRank around each source node. Briefly, a personalized PageRank is like standard PageRank, except that when randomly teleporting to a new node, the surfer always teleports back to the given source node being personalized (rather than to a node chosen uniformly at random, as in the classic PageRank algorithm). He starts at the source node $X$ that we want to calculate a personalized PageRank around. At step $i$: with probability $p$, the surfer moves to a neighboring node chosen uniformly at random; with probability $1-p$, the surfer instead teleports back to the original source node $X$. The limiting probability that the surfer is at node $N$ is then the personalized PageRank score of node $N$ around $X$. * a list of the nodes with the highest personalized PageRank scores. *         running a personalized PageRank for K iterations) pairs. probs(user) = 1 // We start at this user. 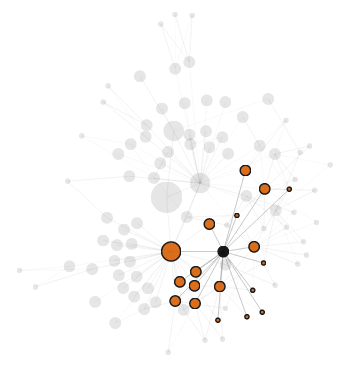 * Simulates running a personalized PageRank for one iteration. *         specified number of iterations. // Holds the updated set of probabilities, after this iteration. // With probability 1 - alpha, we teleport back to the start node. Start at a specified user node and give it some score. In the first iteration, this user propagates its score equally to its neighbors. In the second iteration, each user duplicates and keeps half of its score S. It then propagates S equally to its neighbors. * Calculate propagation scores around the current user. * - Give the starting node N an initial score S.
*   and then propagates the original again to its neighbors. * traveled to via a backwards/follower link don't keep half of their score. * @return a sorted list of (node, propagation score) pairs. // We propagate the score equally to all neighbors. // ...and make sure it keeps half of it for itself. // neighbors) don't keep any score for themselves. I played around with tweaking some parameters in both approaches (e.g., weighting followers and followees differently), but the natural defaults (as used in the code above) ended up performing the best. After pruning the set of candidate destination nodes to a more feasible level, I fed pairs of (source, destination) nodes into a machine learning model. From each pair, I extracted around 30 features in total. As mentioned above, one feature that worked quite well on its own was whether the destination node already follows the source. I also used a wide set of similarity-based features, for example, the Jaccard similarity between the source and destination when both are represented as sets of their followers, when both are represented as sets of their followees, or when one is represented as a set of followers while the other is represented as a set of followees. * Returns the Jaccard similarity between two sets, 0 if both are empty. * Returns the cosine similarity between two sets, 0 if both are empty. Along the same lines, I also computed a similarity score between the destination node and the source node’s followees, and several variations thereof. * sum of these similarities. 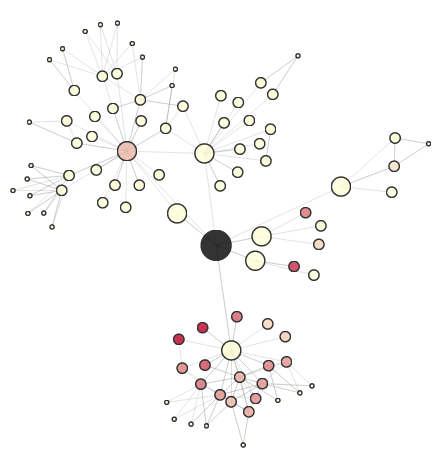 Other features included the number of followers and followees of each node, the ratio of these, the personalized PageRank and propagation scores themselves, the number of followers in common, and triangle/closure-type features (e.g., whether the source node is friends with a node X who in turn is a friend of the destination node). If I had had more time, I would probably have tried weighted and more regularized versions of some of these features as well (e.g., downweighting nodes with large numbers of followers when computing cosine similarity scores based on followees, or shrinking the scores of nodes we have little information about). But what are these features actually doing? Let’s use the same app I built before to take a look. 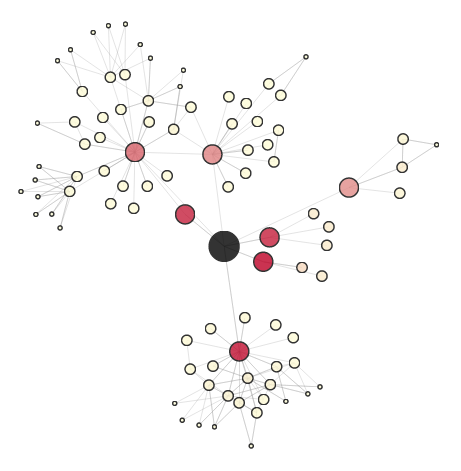 …we can see that, as expected (because edges that represented both following and follower were double-weighted in my PageRank calculation), the darkest red nodes are those that are friends with the central node, while those in a following-only or follower-only relationship have a lower score. 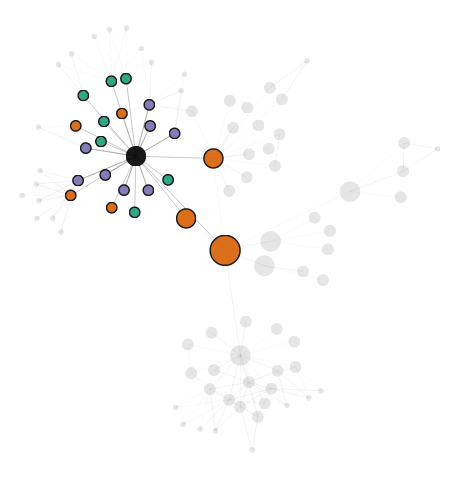 …we can see that followed nodes (in teal) receive a higher propagation weight than friend nodes (in purple), while follower nodes (in orange) receive almost no propagation score at all. 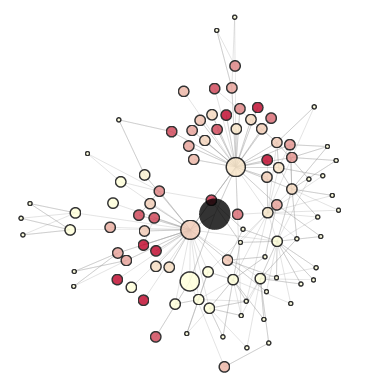 We can see that, while the PageRank and propagation metrics tended to favor nodes close to the central node, the Jaccard similarity feature helps us explore nodes that are further out. In other words, their high Jaccard similarity is due to the fact that they don’t have many connections to begin with. This suggests that some regularization or shrinking is in order. 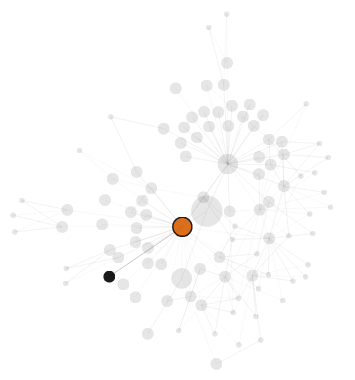 We can see that the outlier nodes are much more muted this time around. Notice, in particular, how the popular node in the top left and the popular nodes at the bottom have a much higher score when we regularize. And again, there are other networks and features I haven’t mentioned here, so play around and discover them on the app itself. Now you don’t want each of your friends to do the same thing and give you the same answer, so you first give each of them slightly different data. After all, you’re not absolutely sure of your preferences yourself – you told Willow you loved Titanic, but maybe you were just happy that day because it was your birthday, so maybe some of your friends shouldn’t use the fact that you liked Titanic in making their recommendations. Or maybe you told her you loved Cinderella, but actually you *really really* loved it, so some of your friends should give Cinderella more weight. So instead of giving your friends the same data you gave Willow, you give them slightly perturbed versions. You don’t change your love/hate decisions, you just say you love/hate some movies a little more or less (you give each of your friends a bootstrapped version of your original training data). For example, whereas you told Willow that you liked Black Swan and Harry Potter and disliked Avatar, you tell Woody that you liked Black Swan so much you watched it twice, you disliked Avatar, and don’t mention Harry Potter at all. # STEP 1: Read in the training examples. truths =  # A truth is 1 (for a known true edge) or 0 (for a false edge). training_examples =  # Each training example is an array of features. # STEP 2: Train a classifier. 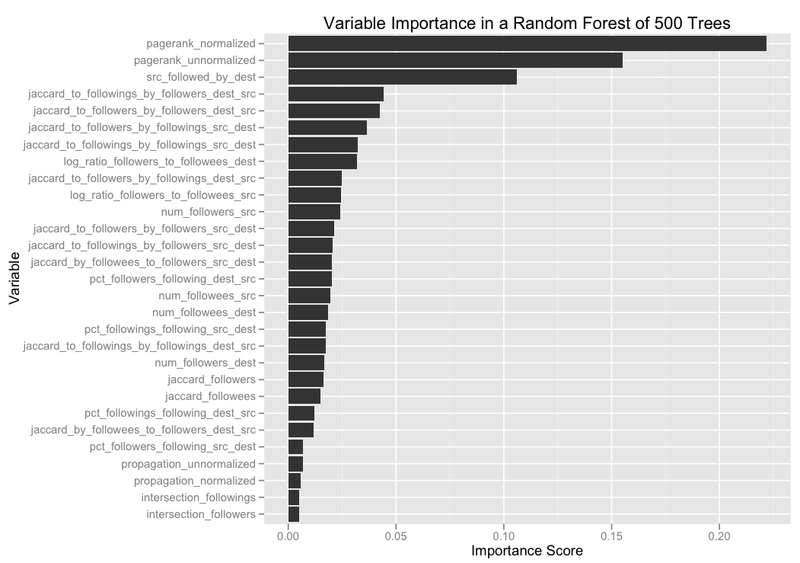 So let’s look at the variable importance scores as determined by one of my random forest models, which (unsurprisingly) consistently outperformed logistic regression. The random forest classifier here is one of my earlier models (using a slightly smaller subset of my full suite of features), where the targeting step consisted of taking the top 25 nodes with the highest propagation scores. Whether the destination node already follows the source. How similar the source node is to the people the destination node is following, when each node is represented as a set of followers. (Note that this is more or less measuring how likely the destination is to follow the source, which we already saw is a good predictor of whether the source is likely to follow the destination.) 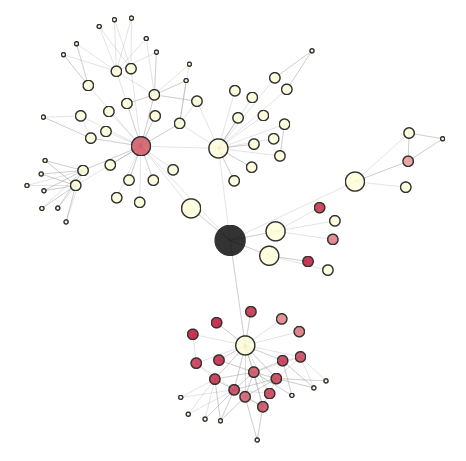 Plus several variations on this theme (e.g., how similar the destination node is to the source node’s followers, when each node is represented as a set of followees). How do all of these models compare to each other? Is the random forest model universally better than the logistic regression model, or are there some sets of users for which the logistic regression model actually performs better? To enable these kinds of comparisons, I made a small module that allows you to select two models and then visualize their sliced performance. Above, I bucketed all test nodes into buckets based on (the logarithm of) their number of followers, and compared the mean average precision of two algorithms: one that recommends nodes to follow using a personalized PageRank alone, and one that recommends nodes that are following the source user but are not followed back in return. We see that except for the case of 0 followers (where the “is followed by” algorithm can do nothing), the personalized PageRank algorithm gets increasingly better in comparison: at first, the two algorithms have roughly equal performance, but as the source node gets more followers, the personalized PageRank algorithm dominates. Admittedly, building a slicer like this is probably overkill for a Kaggle competition, where the set of variables is fairly limited. But imagine having something similar for a real world model, where new algorithms are tried out every week and we can slice the performance by almost any dimension we can imagine (by geography, to make sure we don’t improve Australia at the expense of the UK; by user interests, to see where we could improve the performance of topic inference; by number of user logins, to make sure we don’t sacrifice the performance on new users for the gain of the core). // STEP 1. 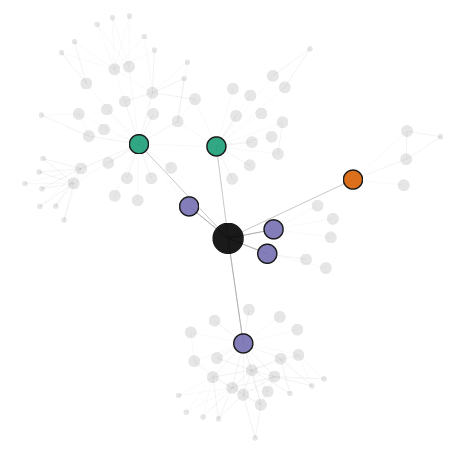 Load the adjacency graph into a matrix. // Binary matrix where cell (u1, u2) means that u1 follows u2. // Binary matrix where cell (u1, u2) means that u1 is followed by u2. // different weights on the following vs. follower edges. // STEP 2. Compute the personalized PageRank scores. // for more information on personalized PageRank. // and output the top candidates. 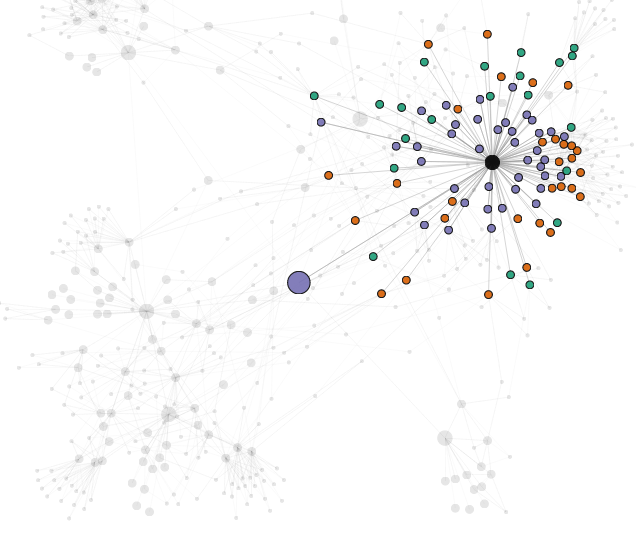 * personalized PageRank probabilities around node i. *   - with probability 1 - alpha, we go back to where we started. *   - with probability alpha, we go to a neighbor. *                 where the ith node teleports back to. *                probabilities around the ith node. *           teleporting back to the start). *   numIterations - the number of personalized PageRank iterations to run. Not only is this matrix formulation a more natural way of expressing the algorithm, but since Scalding (by way of Cascading) supports both local and distributed modes, this code runs just as easily on a Hadoop cluster of thousands of machines (assuming our social network is orders of magnitude larger than the one in the contest) as on a sample of data in a laptop. Big data, big matrix style, BOOM. // A matrix where the cell (i, j) is 1 iff user i is followed by user j. // user i and user j, when both are represented as sets of their followers. Calculate the similarity between B and each book you bought. Sum up all these similarities to get your recommendation score for B. // A matrix where cell (i, j) holds the similarity between books i and j. // book j to user i. * the sum of these similarities. * The matrix version of the above function. For people comfortable expressing their computations in a vector manner, writing your computations as matrix manipulations often makes experimenting with different algorithms much more fluid. Imagine, for example, that you want to switch from L1 normalization to L2 normalization, or that you want to express your objects as binary sets rather than weighted vectors. Both of these become simple one-line changes when you have vectors and matrices as first-class objects, but are much more tedious (especially in a MapReduce land where this matrix library was designed to be applied!) when you don’t. By now, I think I’ve spent more time writing this post than on the contest itself, so let’s wrap up. Scala, for code that needed to be fast (e.g., extracting features) or that I was going to run repeatedly (e.g., scoring my validation set). Python, for my machine learning models, because scikit-learn is awesome. Ruby, for quick one-off scripts. R, for some data analysis and simple plotting. 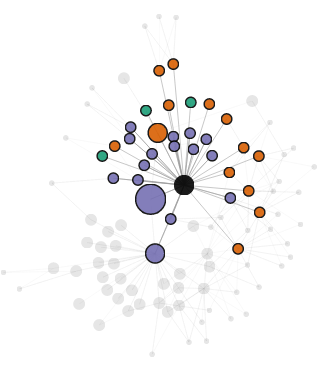 Coffeescript and d3, for the interactive visualizations. 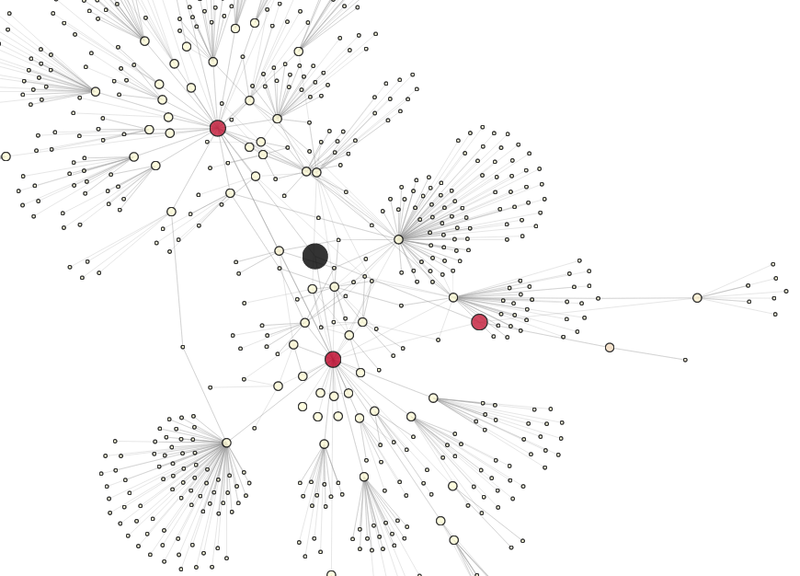 Information transmission in a social network, a case study in how information propagates through a social graph. Movie recommendations in Scalding, Twitter’s Scala-based Hadoop framework built on top of Cascading. A summary of the algorithms behind the Netflix Prize, another crowdsourced recommendation contest for predicting movie ratings.